Air conditioning is a modern-day luxury that many of us can't imagine living without. Unfortunately, according to energy.gov, air conditioners are responsible for 6% of all the electricity produced in the US, and costs homeowners around $29 billion annually. Needless to say, when an #OhmHour hits, turning your AC off is one of the biggest things you can do to lower your energy consumption. But when it's 90 degrees outside, and your house has been baking in the sun all day, flipping that AC off is difficult. Cooling Memory Foam Pillow - $40, Made specifically to absorb body heat. Our favorite reviewer comment: "Throughout the night my head stayed at a comfortable temperature especially when shifting to a new spot for another little cool burst." Cooling Neck and Head Wrap - $10, Whether you wrap it around your neck, or use it as a headband, all you need to do is soak it in cold water, squeeze out the excess water, and tie it on. It will keep you nice and cool, and can be reactivated simply by soaking it in more cold water. Some even love using these to help their pets keep cool. Our favorite reviewer comment: "I wear mine like a headband and it's like a cool shot to the brain when I get foggy." Aquabot Cooling Cap - $40, This handy cap fits on most wide-mouth water bottles, turning them into a cooling mister - perfect for hikes, runs or even a picnic in your backyard. Our favorite reviewer comment: "I love the fact that I could adjust the water pressure from most to jet stream. This is all I need to carry in my backpack when hiking or just taking my dog out for a walk." Peter Pan Extra Long Hot Water Bottle - $40, Despite the name, hot water bottles can work as cold water bottles, too. This extra-long bottle is perfect for filling with ice water and tucking next to you on the sofa while you read, or even settling in to sleep for the night. Our favorite reviewer comment: "Love it! I am a hot water bottle addict and this one is amazing. The cover is so soft and you can tie the front to the back to wear it on your lower back or torso." 6-pack Blackout Paper Shades - $30, One of the best ways to keep your house cool is to keep your curtains and blinds shut during the day, to keep heat out. These blackout shades are perfect to quickly affix to your windows, even if you already have window coverings (or are a renter). Our favorite reviewer comment: "Ninety-degree days are a piece of cake to deal with using these shades." Reflective Curtains - $10, If you're looking for something a little more permanent than the blackout paper shades, these curtains will reflect those hot summer rays out of your house. Our favorite reviewer comment: "I've been buying this product for 6 or 7 years now. They really work to cut down the sun/heat in a room." Heat Reflecting Film - $30, Take your heat-busting window treatments to the next level with heat reflecting film. Perfect if you want to keep your curtains open to let in the light, without suffering from the temperature-raising effects. Our favorite reviewer comment: "I was able to measure the difference in heat that came through by using an IR thermometer on some black carpet that was hit by the sunlight through the window with the film and without. The film reduced the temperature of the carpet 15 degrees or more!" Popsicle Molds - $10, A delicious way to cool down and spend your next #OhmHour - eating popsicles! Try a new concoctions with the kids, or jump on the popular "Frosé" (frozen + rosé) trend, and make Frosé popsicles for some adult refreshments! Our favorite reviewer comment: "I love these! We mix whatever fruit is ripe in our garden: blueberries, raspberries, plums, grapes...with just enough freshly squeezed orange and lime to hold together." Weber Go-Anywhere Charcoal Grill - $50, One of the most highly rated grills on Amazon, this inexpensive and portable grill is perfectly sized, even for renters. It goes without saying that cooking on your stove, or in your oven, will add extra heat to your house pretty quickly, so cooking more of your meals outside on this handy barbecue will help you keep your home nice and cool. Our favorite reviewer comment: "I bought this as a birthday gift for my boyfriend. It's perfect for our small apartment balcony. The grilling area is large enough to hold six burgers or four chicken breasts. Coals heat up quickly and evenly, and it's not difficult to clean the ashes after use." Evaporative Cooling Vest - $32, This works exactly like the cooling neck wrap, but covers a much larger area to keep you even cooler. Simply soak this vest in cold water for a few minutes, and stay cool for several hours. 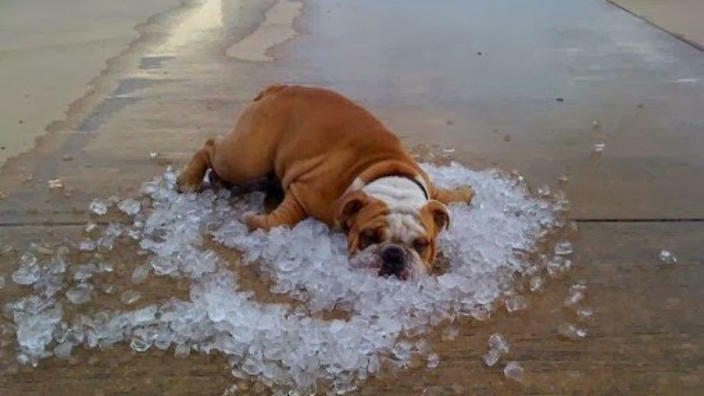 Our favorite reviewer comment: 'This year we have been seeing temps in the high 90s and low 100s with heat indexes 8 to 10 degrees hotter than this. I had to try this cool vest out, figured it was worth the try even if it didn't work... but it actually does work." 100% Pure Cotton Curtains - $30, How do cotton curtains keep you cool? This nifty trick is perfect for days or nights when there's a breeze: put the ends of pure cotton curtains into a bucket of water. The curtains will wick the water until they're damp. Open the window and let the breeze run through the cool, damp curtains to create a nice little cross-breeze. Cooling Sleeping Mats - $120-140 (depending on bed size), These are an investment, but those who use them swear by them. Made of bamboo pieces (rattan is also available and less costly), these mats wick away body heat and, unlike many gel-based alternatives, doesn't actually retain the heat, which means its cooling effects last much longer. Our favorite reviewer comment: "It is the same cooling temperature when I wake up in the morning as when I go to bed at night. It seems to act like a heat sink." What are your favorite products for keeping cool while reducing energy? Leave us a comment below and we'll feature it in our next roundup!